Until the movie Monster, Charlize Theron was known for her striking beauty and work as a model. Her role as Aileen Wuornos catapulted her acting career, and enabled audiences to take her seriously as an actress. As can be seen from the photo above, Charlize went through a major physical transformation to make herself look as identical as possible to the real Aileen Wuornos, and the resemblance between the true is truly remarkable. 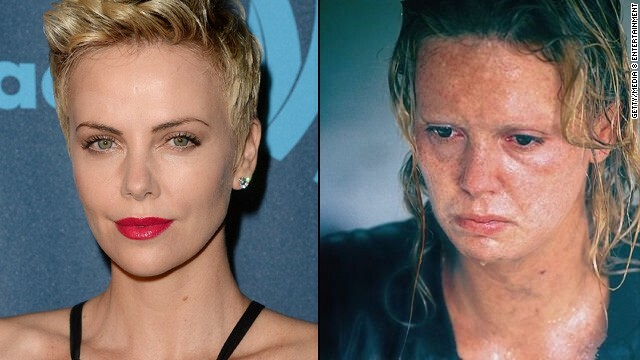 Charlize shaved off her eyebrows, colored her hair, wore contacts and prosthetic dentures, and through the use of make up, her skin was made to look aged and blotchy. One of the most impressive transformations include her weight gain of 30 pounds. In an interview with Stumped Magazine, Charlize explains that she refused to simply wear a “fat suit” because she wanted to transform her own body so she could feel that she was physically in Aileen’s skin. She explains that this weight gain enabled her to move “the way she moved in her body” and truly feel like she was Aileen. In “A Practical Handbook for the Actor” it is stated that ornaments – external costumes and make up, can help an actor get into a role and embody the character they are playing. I believe this was certainly the case with Charlize in her role as Aileen Wuornos. Furthermore, I believe that the physical transformation Charlize Theron undertook for this role was the single most important step that was driving her performance. Evidence for this stems from an important note that Melanie mentioned in discussion after the film, Melanie mentioned that the voice overs throughout the film were not as convincing as the actual performance in the film itself. When listening to Charlize’s voice overs, her accent drops, the deepness in her voice falters, and we do not hear Aileen, we hear Charlize. But why is this so? Melanie reminded us that during voice overs, actors do not typically get into costume, they simply walk into a recording studio and read lines in their regular attire. Thus it could be proposed that Charlize needed all of the make up and prosthetics to truly feel like Aileen and do this role justice. Nevertheless, Charlize Theron’s depiction of Aileen Wuornos was brilliant, and she truly deserved the Academy Award and Golden Globe Award she received for this performance.